NetIOC is only available on the vNetwork Distributed Switch (vDS). To enable it, in the vSphere web client go to Networking, Manage, Settings, click on the third icon from the left (Edit distributed switch settings) and enable Network I/O Control. Once enabled go to the Resource Allocation tab there you will find an overview of the (predefined) Network Resource Pools, Host Limits and Physical Adapter Shares and the Shares value. * The vSphere client marks this as a User defined network resource pool, while the web client marks this (correctly) as system network resource pool. NetIOC classifies incoming traffic and binds it automatically to the correct system network resource pool; therefor you do not have to assign the vMotion traffic network resource pool to the distributed port groups manually. Once a vMotion operation starts NetIOC “tags” it as vMotion traffic and assigns the appropriate share value to it. The user interface displays the term (default) in the Network resource pool settings screen. vSphere 5.0 introduced User-defined network resource pools and these are only applicable to virtual machine network traffic. User defined network pools are excellent to partition your network when multiple customers are using a shared network infrastructure. NetIOC shares are comparable to the traditional CPU and memory shares. In the case of NetIOC, shares assigned to a network resource pool determine the portion of the total available bandwidth if contention occurs. Similar to compute shares, shares are only relative to the other active shares using the same resource. NetIOC provides 3 predefined share levels and a custom share level. The predefined share levels; low, normal and high provide an easy method of assigning a number of shares to the network resource pool. Low assigns 25 shares to the network resource pool, Normal 50 shares and High 100 shares. Custom allows you to assign the number of shares yourself within the supported range of 1 – 100. By default every system network resource pool is assigned 50 shares with the exception of the virtual machine traffic resource pool, this NRP gets 100 shares. This means that 50+50+50+100 (250) shares are active, in this scenario the virtual machine network resource pool gets to divide 40% (100/(50+50+50+100)) of the available physical network bandwidth. If vmnic0 was a 10GB NIC, the virtual machines network pool would receive 4GB to distribute amongst the actively transmitting virtual machines on that host. This was a worst-case scenario because usually not all portgroups are transmitting, as the shares are relative to other network pools actively using the physical adapter it might happen that Virtual Machine and vMotion traffic is only active on this NIC. In that case only the shares of the vMotion NRP and VM NRP are compared against each other to determine the available bandwidth for both network resource pools. 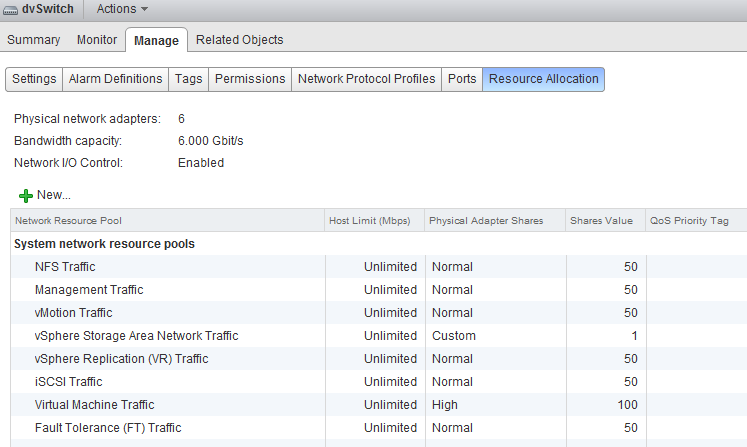 Up to vSphere 5.1 NetIOC applies a limit per host. This means that the host limit enforces a traffic bandwidth limit on the overall set of dvUplinks for that particular network resource pool. The limit is expressed in an absolute unit of Mbps. This means that if you set a 3000Mpbs limit on the vMotion network resource pool, the traffic stream of the vMotion network resource pool will never exceed the given limit of 3000Mpbs for a distributed switch out of a particular ESX host. vSphere 5.1 introduced a big adjustment to hosts limits, the host limits now applies to each individual uplink. This means that when setting a host limit on the network resource pool for vMotion of 3000Mbps, vMotion is limited to transmit a maximum of 3Gb per uplink. In the case of a Multi-NIC vMotion configuration (2NICs) the maximum traffic vMotion can issue to the vmnics is 6Gb. Please note that limits only apply on ingress traffic (incoming traffic from vm to vds) meaning that a limit only affects native traffic coming from the active virtual machine running on the host or the vMotion traffic initiated on the host itself. The next article in this series is how to use NetIOC for predictable network performance when using a Multi-NIC vMotion configuration on a distributed vSwitch. This may be an odd question. But the resource pools apply only to physical adapters on the specific dvSwitch or have I misunderstood something? In our setup vMotion and VM traffic have different dvSwitches and different physical adapters so I would expect that NRPs on the VM traffic do not interfer with the vMotion on other network adapters and switches but I not certain from the description above. Very very interesting and clear article Frank, thanks. It’s just a detail but i think you misnamed the vmnics on the DvUplink2, i guess we must read vmnic1 for the 3 ESX hosts. Agree with NiTRo, I couldn’t understand the convention in vmnics Frank… Explain?.. We’re into big debate around quite the same topic these days, add eternal questions like ” “to LACP or not to LACP” and some proprietary GuestOS clustering/heartbeating. It weird Omnigraffle error was the cause Arseny. It should have been vmnic1 from their respective hosts. 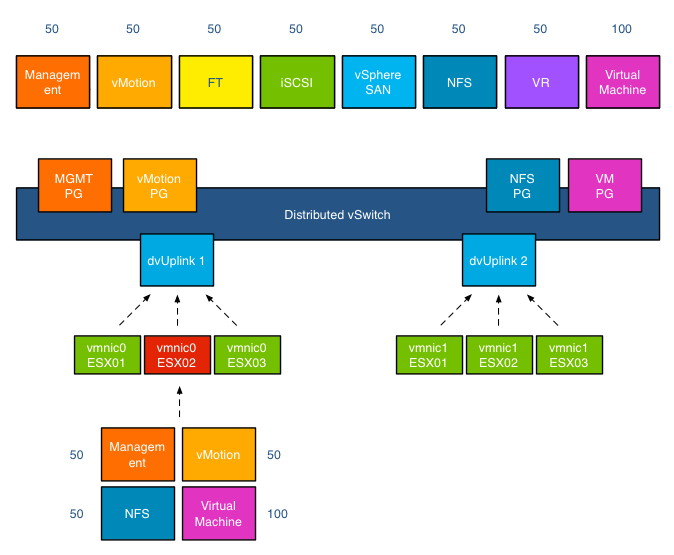 What’s the “vSphere Storage Area Network Traffic” system network resource pool for? To me it could be for the CNA or software FCoE traffic, yet I’m still trying to get a confirmation. If I use iSCSI traffic directly from a virtual machine (Windows ISCSI initiator connecting to the SAN), will Network I/O control classify this as “iSCSI Traffic” or just “Virtual Machine Traffic”? I suppose the latter?